In my house, my husband and I celebrate our birthdays with a weekend of nice meals. This year my hubby picked out quite the spread for mine. . . . and then mentioned that I should make some of it to ensure it came out perfect. The item in particular he had in mind was scallops, which turned out to be serendipitous since scallops are a key ingredient in a recipe I wanted to enter in the Saucy Mama contest. The Saucy Mama contest involves a select number of food bloggers who create inventive and tasty dishes with at least one of the Saucy Mama products to vie for a spot in the Word Food Championships. Since I love the time saving benefits of adding a delicious pre-made sauce to my recipes (and I would love to win a trip to Orlando to compete in the seafood category of the WFC) I jumped at the chance to compete. After tasting each, I had recipe ideas for all of them, but I ultimately chose the first two to showcase in my baked sea scallops recipe. The remaining four are equally as tasty, so don’t be surprised if you see other upcoming posts featuring one of them. The Parmesan Garlic Marinade I thought would be perfect on a fresh succotash. I decided to use fresh corn right off the cob, and then swapped out the typical lima beans for fresh, blanched fava beans. A bit of grape tomatoes, and bacon (you can’t leave out the bacon!) completed the succotash, which got a coating of the Saucy Mama Parmesan Garlic Marinade. Don’t be fooled by the marinade title – the concentrated flavors are mellowed by the salad, creating a perfectly seasoned succotash. The Saucy Mama Tarragon Lemon Mustard is just the flavoring I was looking for to add to the crust for the scallops. I stirred it into panko before sprinkling on top of the sea scallops, and reserved a bit to stir into a lemon brodetto. You may be surprised that I chose to bake the sea scallops, since often scallops get the lightest of sears. However, I have found baking to produce the most reproducible and tender results, which is why I chose it as my preferred cooking method. The plated dish is a feast for both eyes and stomach. 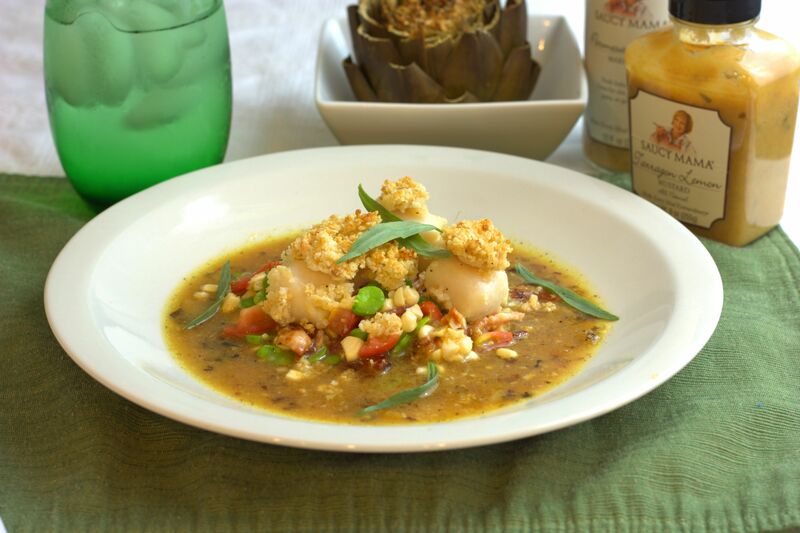 The baked sea scallops sits on top of an island of the succotash, which is surrounded by the lemon brodetto. I must say that enjoying a dinner of Baked Tarragon Lemon Sea Scallops with Parmesan Succotash and Lemon Brodetto was a great way to celebrate my birthday. Being chosen as the winning recipe for the Saucy Mama contest would be icing on the cake (pun intended). Remove the fava beans from the pod, then place the beans in boiling water for 3 minutes. Remove from boiling water and plunge into a cold water bath. Once cooled, remove the outer shell from the fava beans. Place the shelled, cooked fava beans in a large bowl and set aside. 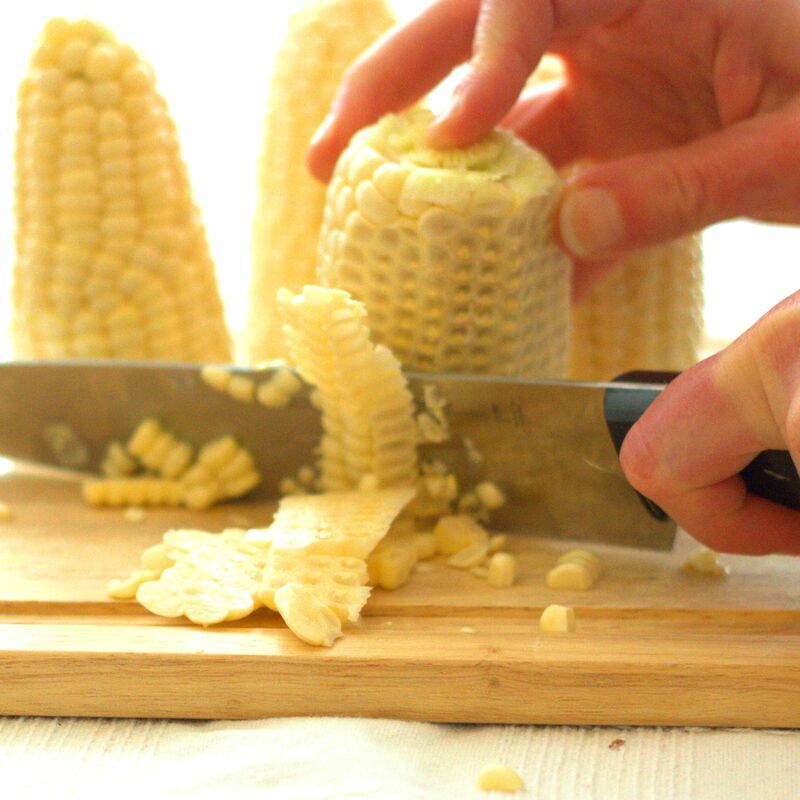 Shuck the corn, then cut the kernels from the cob, and chop the fresh kernels until no large chunks remain. Add the kernels to the fava beans and refrigerate until ready to prepare the succotash. In a large skillet, fry the bacon, turning once, until crispy, about 8 minutes total. Remove the bacon from the pan and drain on paper towels. Drain the bacon fat from the skillet, reserving two tablespoons of the fat in the pan. Place the pan over medium heat and add the shallots to the pan. Saute until softened, about 2-3 minutes. Deglaze the pan with the chicken stock. Add the lemon juice and lemon zest to make the brodetto and keep warm. Preheat oven to 400 °F. Place sea scallops, and melted butter and in a bowl. Season with salt, and pepper. Stir gently to combine. Transfer to a lightly greased 8-inch by 8-inch casserole dish. In a separate bowl, combine panko and 3 tablespoons of the Saucy Mama tarragon lemon mustard. Sprinkle on top of the sea scallops and pat down. Bake in preheated oven until crumbs are brown and sea scallops are done, about 15 minutes or until center of scallop reaches 130 °F and they are opaque and milky white. 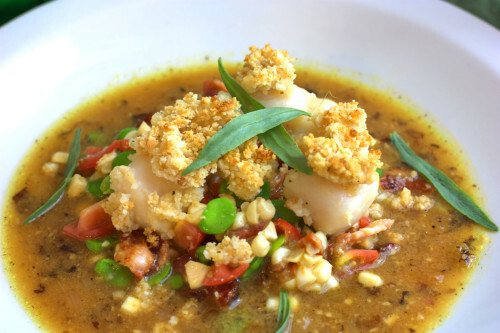 While the scallops are baking, prepare the succotash. Remove the fava beans and corn from the refrigerator and add the grape tomatoes, and then dice the cooked bacon and add to the fava bean mixture. Pour the Saucy Mama parmesan marinade over the fava beans and stir until well coated and the succotash is mixed. When the sea scallops are done, remove them from the oven and begin to plate. Stir the remaining mustard into the lemon brodetto, and divide between four shallow dishes. Evenly divide the succotash between the four shallow dishes, placing in a circular pile in the center of the dish. Evenly top the succotash with the baked scallops, about 6 per dish. Sprinkle each dish with some of the fresh tarragon and serve immediately. 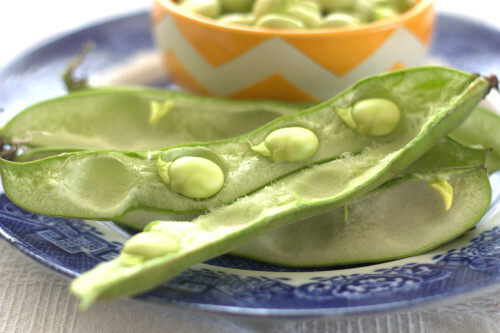 Note: If fresh corn and fava beans cannot be found, 1 cup of thawed, frozen corn and ¾ cup of thawed, frozen fava beans can be used as substitution. This entry was posted in Entree and tagged cooking contest, fish, vegetables. Seriously! This not only looks beautiful but sounds delicious. My son has been asking for scallops. I may have to try this! it sounds complicated but looks really tasty and so summer-ready! I actually really enjoy the flavor of scallops with tarragon! It sounds fancy, but it really isn’t complicated. Give it a try! This recipe looks great. I love scallops so I have to try it. Good luck in the Saucy Mama contest. I can’t think of a better compliment, Jan! Thank you for your glowing review.